Hundreds of schools and businesses announced closures for Wednesdays as the lowest temperatures in 15 years are expected to keep North Texas roads icy and slick. An Arctic cold front dumped a mix of sleet and snow on the Metroplex on Tuesday. But it's not over yet -- bitterly cold temperatures could keep many side streets covered in sheets of ice. By Wednesday morning, more than 750 school districts, schools and businesses announced another round of closures for Wednesday, with dozens more announcing delays. And hundreds of additional closings were announced for Thursday, including Dallas, Arlington, Fort Worth and Denton school districts. Wednesday's high of 20 is the coldest maximum temperature in North Texas in more than 20 years. Meteorologist Grant Johnston updates the forecast for Wednesday, February 2, 2011. 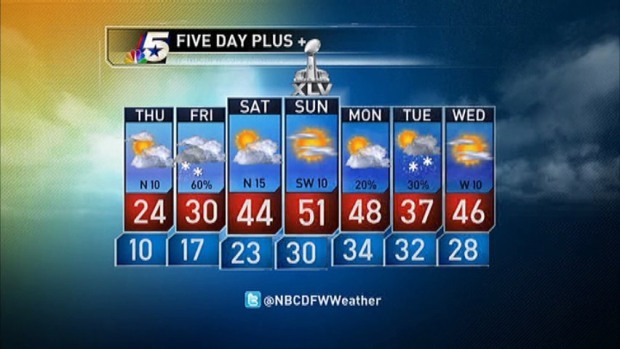 Temperatures are expected to remain below freezing until Saturday afternoon, said Grant Johnston, NBC DFW meteorologist. The low is forecast to be 10 degrees overnight, with the high Thursday expected to reach only 24 degrees. The National Weather Service has issued a Wind Chill Advisory and Hard Freeze Warning until noon Thursday. 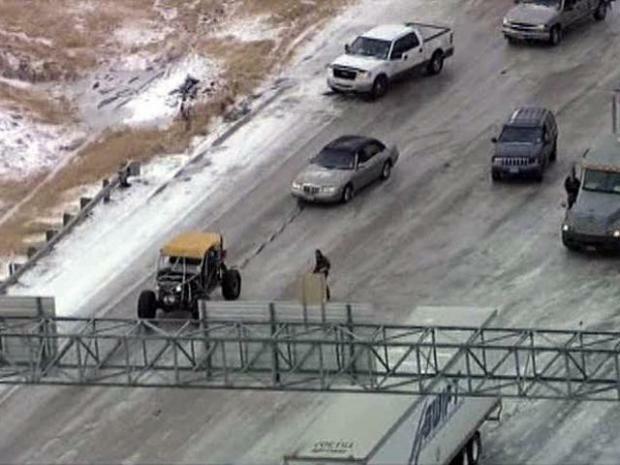 Good Samaritans help vehicles navigate the blanket of ice on southbound Loop 12 at Davis Street in Dallas. Drivers are urged to take extra precautions and carry a blanket and cell phone, have a full tank of gas and dress in layers. Exposed skin can sustain frostbite within minutes. Thin sheets of ice coating highways across North Texas kept road crews busy throughout the night. Icy patches could be seen on Interstate 35 overpasses late Tuesday night, and many side streets were covered in sheets of ice. More than 300 local Texas Department of Transportation crews, as well as 82 crews from West Texas crisscrossed North Texas interstates in hopes of making the roads drive-able. "We've done everything we can, and we followed the game plan," TxDOT spokeswoman Michele Releford said Tuesday. TxDOT's plan involved sanding and treating major roads leading to Cowboys Stadium and Super Bowl events. "These extra crews were brought in because of the Super Bowl," Releford said. "We knew we were going to need extra people to keep all the lanes of the major roadways open." Some roads proved to be not driveable and had dozens of wrecks. But Releford said some of the crashes were caused by driver error. "This morning, I noticed the ice was more rough and it had more traction, and I think people were a little more cavalier about their driving, thinking it had been treated with something, or there was more traction, and it was just rough ice, and they had quite a few accidents," she said. Officials say that drivers should still be cautious if the road has been treated with sand and salt. 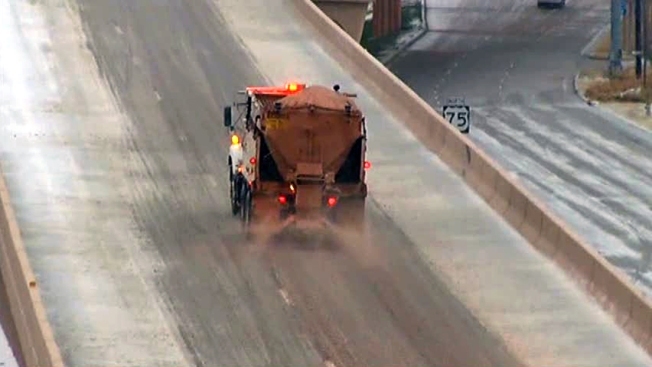 The sand mixture TxDOT uses contains about 10 percent salt. The agency said it does not use more salt because it is too corrosive to bridges, roads and cars. Releford said TxDOT plows were called in from West Texas because the agency's North Texas crews don't have such equipment. She also said that sand and salt supplies were running low at one point, but supplies were brought in from Austin, San Antonio and Houston. Crashes were reported across North Texas on Tuesday, with the drive home even worse than the morning commute in Dallas. But Good Samaritans lent hands in Fort Worth and in Dallas to stuck drivers. In Fort Worth, grateful drivers received assistance on slick North Beach Street. And the people behind the wheel of a homemade rock crawler helped vehicles navigate Loop 12 at Davis Street in Dallas.